Only one birth to report today, of a 1st cousin 3 times removed. Birth of Catherine Adam at Stevenston, Ayrshire, daughter of my ggg aunt Margaret Haddow and her husband Francis Adam. I’d not researched her beyond knowing her birth, so had a look to see if anyone on Ancestry had done some decent research, and fortunately someone had, and I also found her in the census. In 1841 she’s with her parents, father a coal miner, in Stevenston with a lodger John Dean, a coal miner, and also a Dean family living next door. 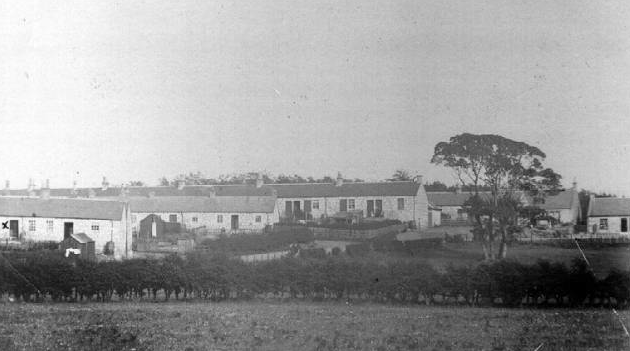 In 1 May 1841 Catherine Adam married John Dean – who I assume was the lodger and had been the boy next door – and in 1851 they’re living at Kenneth’s Row, Corsehill, Kilwinning. I’m beginning to wonder if anyone lived in Kenneth’s Row that I wasn’t related to! It’s an address that crops up over and over again. No children for John and Catherine, though, and they remained childless. In 1861 they’re at Dalziel, Lanarkshire, but were back home in Stevenston in 1871. In 1881, age 67, John Deans has changed occupation and is a game keeper, which is certainly different to coal mining and an understandable change at his age. Catherine died in 1888 at Stevenston, aged 65. Elizabeth Firth was baptised at Royston, Yorkshire, daughter of Joseph Firth and Hannah Fisher. Joseph Firth was my gggg grandfather, and Elizabeth’s sister was Sarah Firth who married my ggg grandfather William Green of Worsbrough. That makes Elizabeth my gggg aunt. I haven’t researched her beyond her baptism so have no idea what became of her. Sarah Ann Green was baptised at St Mary’s Barnsley, daughter of Joseph and Mary Green, bleacher of Barnsley. Joseph was the brother of my ggg grandfather William Green of Worsbrough. No idea what became of Sarah Ann as I have yet to research her. Alexander Strachan was born at Corsehill, son of my gg grandfather Robert Strachan and his second wife Susan Cran, making Alexander my half gg uncle. He’s with his parents in the 1861 census at 24 Kenneth’s Row, age under 1 month, but he’s not with them in 1871 when he would have been 10 and I can’t find him anywhere else, nor can I find a death record for him. He’s a mystery. Amelia Murphy Haddow died at Lamont’s Row, Kilwinning age 2. She was the daughter of Hugh Richmond Haddow, who married Marian Mackay. Hugh was the son of my gg grandparents John Haddow and Amelia Murphy, so Amelia Murphy Haddow was obviously named after her grandmother. Hugh and Marion had a second daughter in 1874 and named her Amelia Murphy Haddow, to the name lived on. Amelia became a recurrent name on my Strachan family tree: my father had a sister called Amelia, more commonly known as Milly. Hmm. Doing this is reminding me that there are a lot of people on my family tree that I know very little about, though I’m glad there’s still plenty more research for me to do. I’ve just added details to the Haddow page, which tells of my Great Grandmother Jeannie Haddow and her parents John Haddow and Amelia Murphy. I was glad to discover Amelia, as this told me why the name Amelia has run in the Strachan family: I had an aunt Amelia, known as Milly, who migrated to Canada. She was my father’s favourite sister and he missed her. So that’s all the pages for my grandparents and great grandparents lines done now. When I have time I’ll write up what I know about the families that connect to my great great grandparents through marriage, and add more detail about the lives of the ancestors I’ve already put on a page. Today, however, it is Sunday and it’s lovely and sunny outside, a very welcome change after the snow and rain of last week, so ancestors will have to wait as the garden is in need of some urgent maintenance.